I am still going string with using fresh lemon in my recipes. After I used up my Meyer Lemons, I got a package of lemons on my doorstep. I am unsure who sent them, but my guess one of my neighbors. So as you can guess more lemon recipes are to come. I simply love lemons. As a kid I used to eat them like an orange. My Mom would yell at me and tell me that they will ruin my teeth. So far so good! 🙂 But I must admit my teeth are a little sensitive now. Anyway, today I made a pretty healthy lemon muffins. 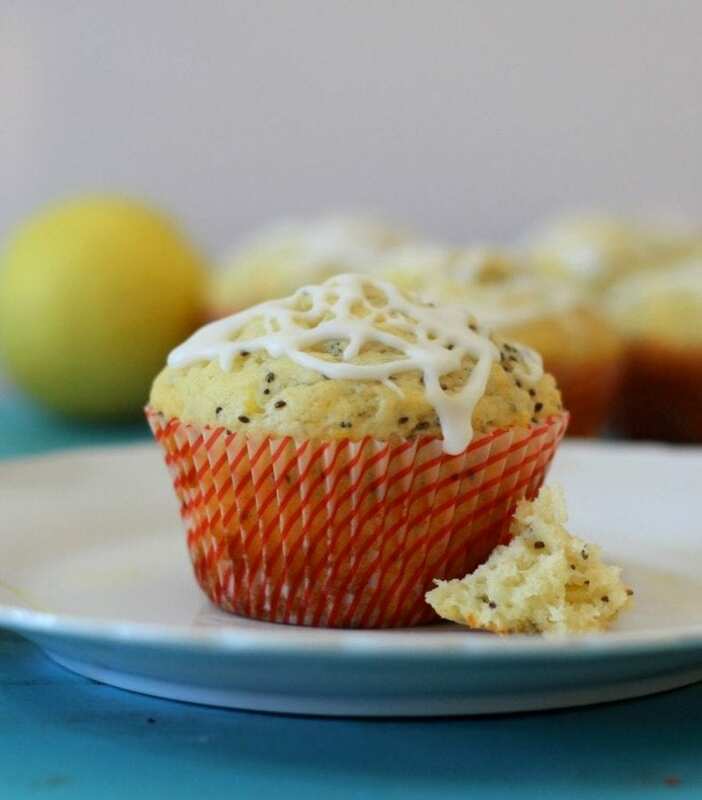 Instead of poppy seeds, I used Chia seeds. Check these bad boys out. These muffins are amazing! 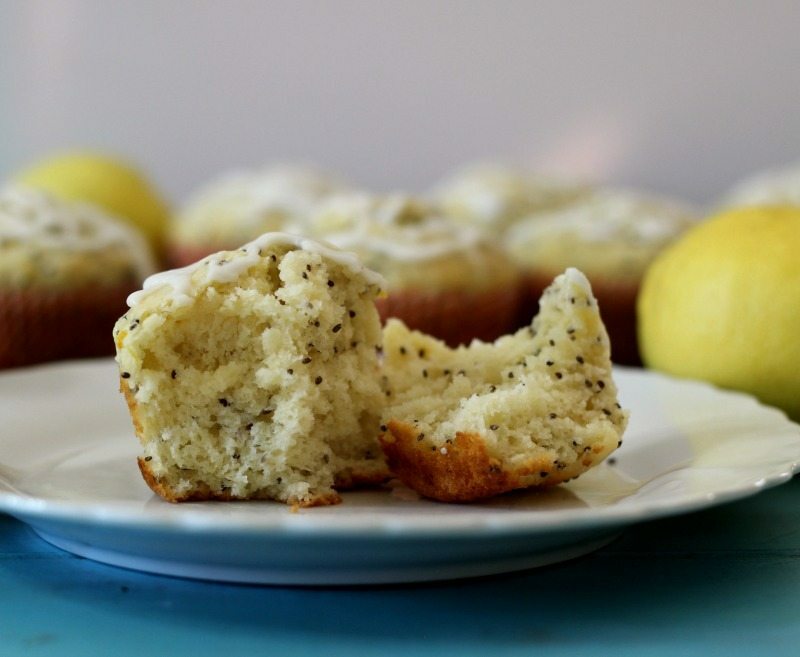 They are light, fluffy, sweet and have the perfect lemon flavor. 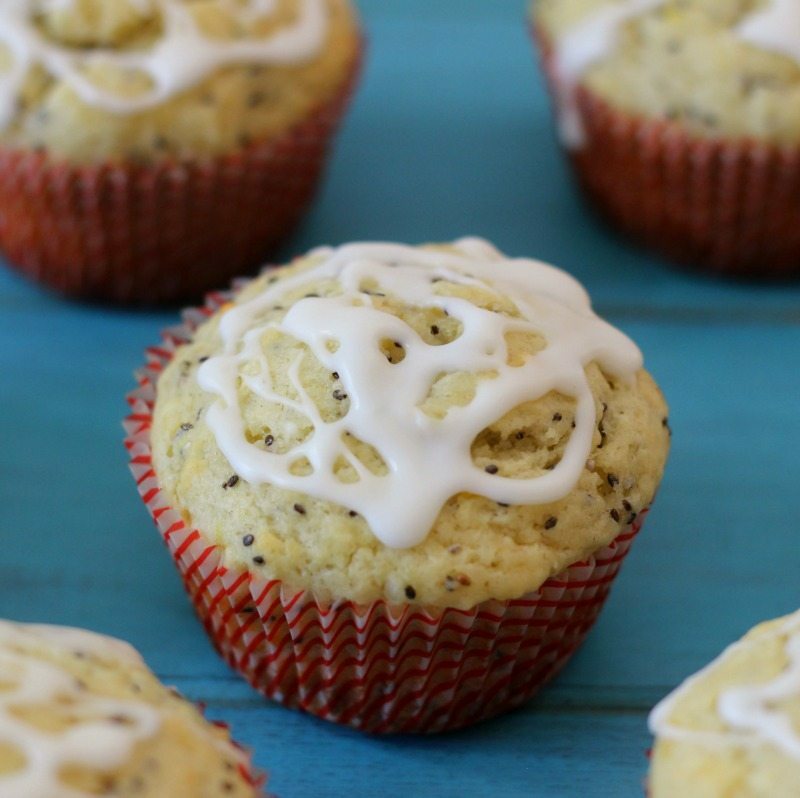 They are made with lemon greek yogurt and as I said before I skipped out on the poppy seeds and use chia seeds for a little bit of protein. This is a great recipe to try to get people to eat chia seeds. To sweeten the muffins up a bit I used a simple lemon glaze over the top. I love the glaze and it adds an extra umph to the recipe. 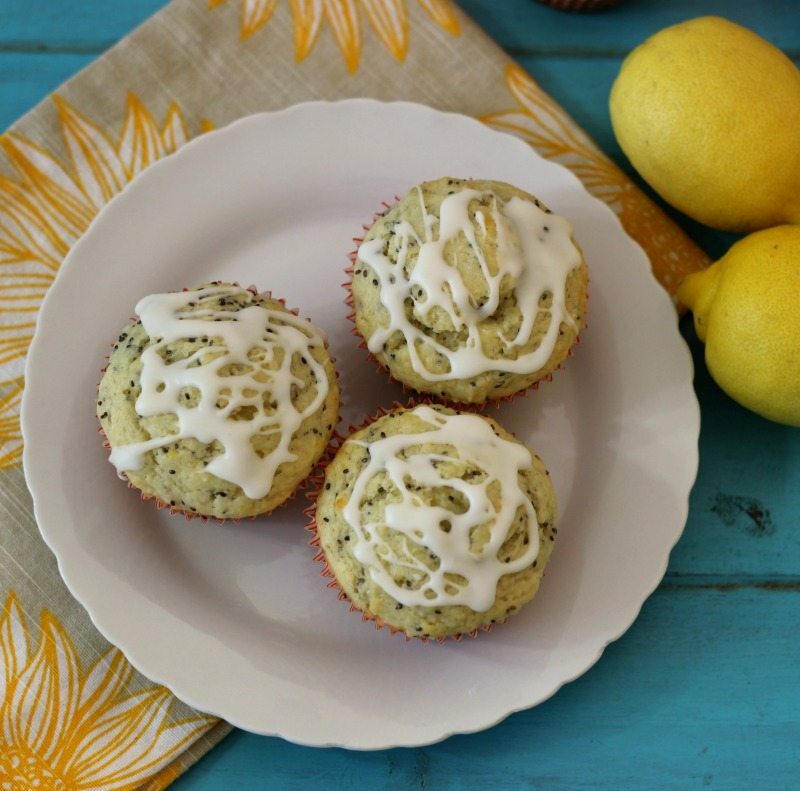 These muffins are a hit with my friends and family. They make for a perfect snack to go with a cup of coffee in the morning. 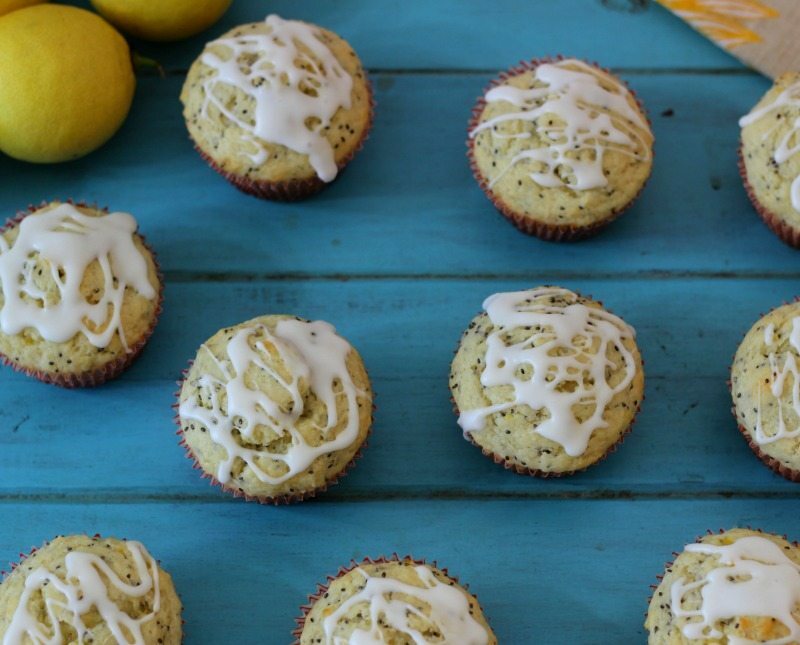 Light fluffy lemon flavored muffins made with Greek yogurt and chia seeds. Line a muffin pan with liners or spray with cooking spray. In a large bowl add sugar and lemon zest. With your fingertips, rub the zest into the sugar. Whisk in flour, baking soda, and salt. Set aside. In a small bowl, add yogurt, eggs, vanilla extract, lemon juice and melted butter; whisk until well incorporated. Pour into flour mixture. Mix until just incorporated. Do not over mix. Stir in chia seeds. Evenly divide the batter between the muffin cups and bake for 15 - 20 minutes, just until lightly golden and center comes out clean with a toothpick. Let cool in pan on cooling rack for 5 minutes. Then carefully take muffins out of pan and let cool completely on rack. To make icing, add powdered sugar and lemon juice; whisk until no lumps remain and is think enough to drizzle on muffins. If too thick add more lemon juice, if to thin add more powdered sugar. Drizzle icing over cooled muffins. Sorry for the delay in posts this week. I was having IT issues, but they are resolved now. I hope you have a great rest of the week.